I think this is a lovely story of the kindness and generosity of strangers for strangers and some tenacity on my part ! 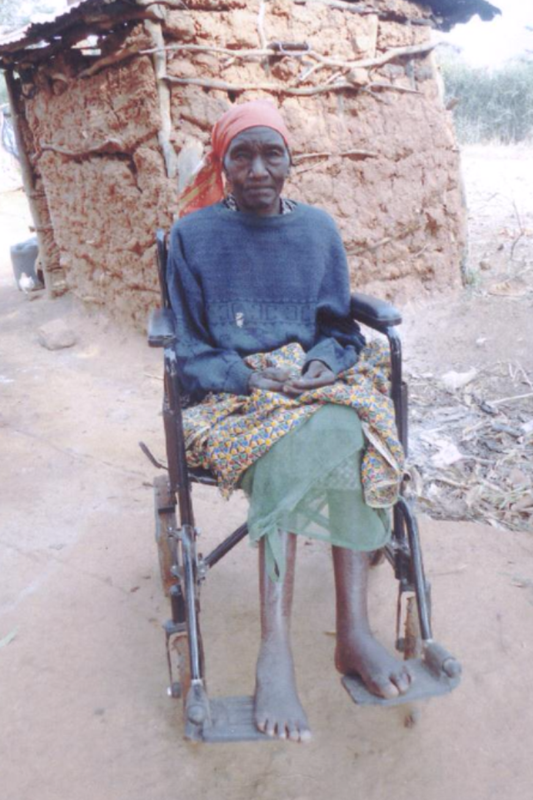 On February the 27th, 2013 I received an email from someone called Veronicah asking for help providing a wheelchair for an elderly relative. I had a feeling this had not come from the UK and replied asking for more detailsonly to learn it had come from the remote village of Mbooni, Kenya. Veronicah is 47 and lives in Mbooni. Not only does she help look after the elderly in the village she also looks after some of the children many of whom have lost their fathers. Many of the children don’t attend school and some don’t have enough food. 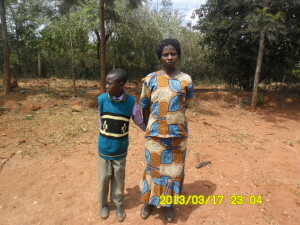 Veronicah, a widow has brought up her two children alone after her husband was killed in a road accident. 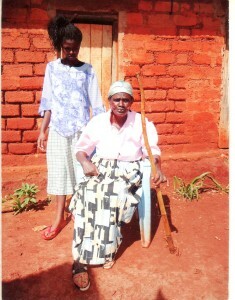 This is a very caring and compassionate woman and I was determined to help her. Most busy people would have decided this was an impossible challenge, however I became determined to meet it. 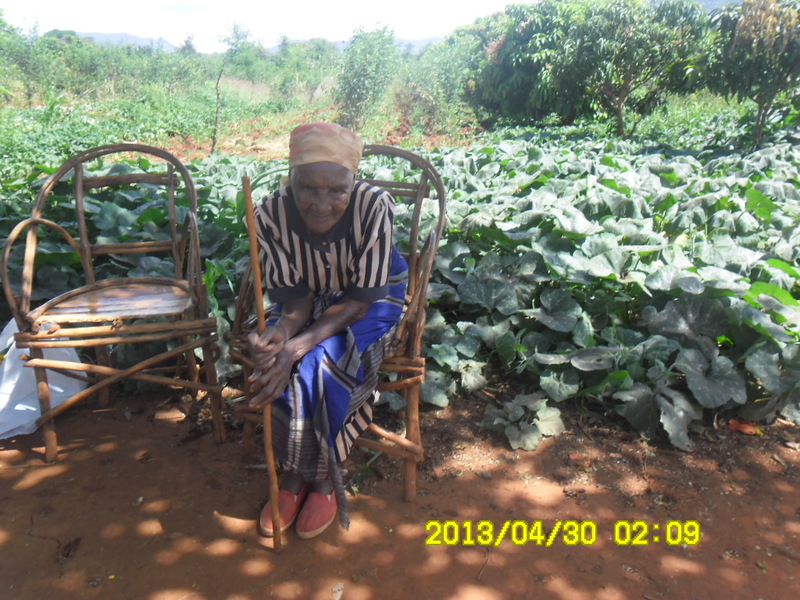 Rachel ( Above and below) is 86 a fantastic age for an African woman. I contacted EVERY organisation she could think to help with this request, Red Cross, UN, World Health Organisation, Rotary Club, The Buddist Temple of Nairobi, the Wheelchair Association, Richard Brandson, the Foreign Consulate for Nairobi to name just a few. For a long time I had few responses and no offer of help. Finally I had a response from the Orthopaedic services manager for the Nairobi branch of the Association for the Physically disabled of Kenya. 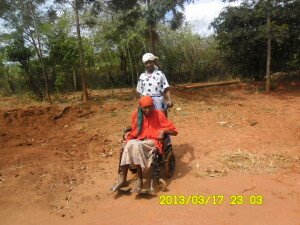 They very kindly offered to donate a wheelchair the only difficulty was they insisted that the recipient had to travel to be fitted for it on two occasions. 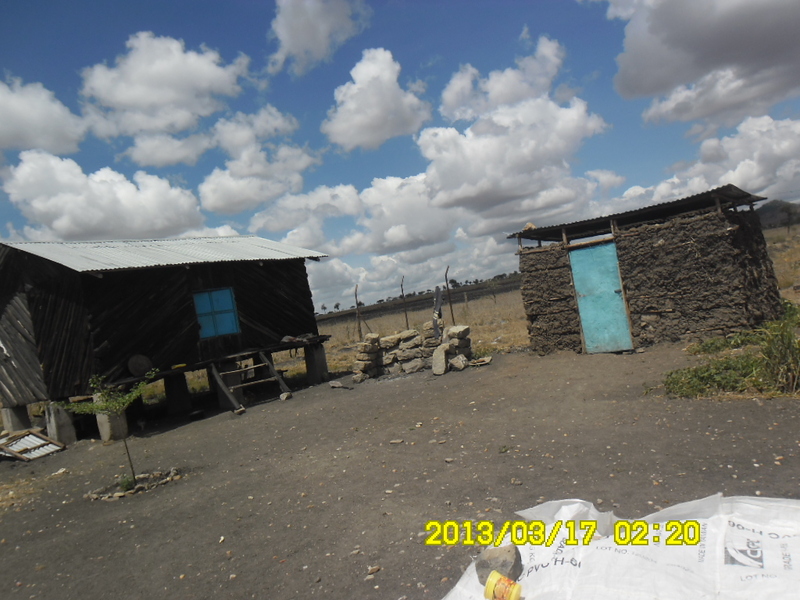 This would involve a round trip of 260 km each time and with little transport apart from the Matatu, local bus. This was impossible for an elderly and infirm woman. Feeling dejected I contacted Veronicah . Whilst absolutely delighted to have the offer of a wheelchair, it now seemed that we would be unable to accept due to the logistics involved. I told her not to give up, somehow I would resolve this. I thought laterally and had the brainwave that the easiest form of transport would be ….Helicopter ! So, I emailed all the helicopter charter companies in East Africa and had one reply. Richard Leach from Hybrid Solutions emailed me explaining that my request would cost up to £3,000 in flying time and that it would be cheaper for them to buy a wheelchair in the UK and fly it out to Nairobi from their UK arm. I was amazed and delighted at this very generous offer of help said I would see if she could find a UK distributor to contribute a wheelchair as Richard was prepared to organise and fund the air transportation. 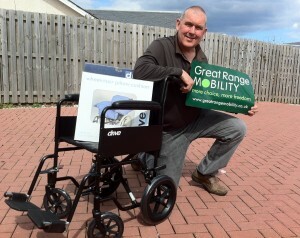 I set about emailing numerous companies throughout the UK and the same day received an offer from Iain McLarty Director of Great Range Mobility, in Berwick upon Tweed, Northumberland. I also decided whilst I had the offer of transportation, to purchase a second wheelchair from Iain for the elderly of Mbooni and they arrived at Wilson Airport in Nairobi during the first week of June to spend almost a week in customs. 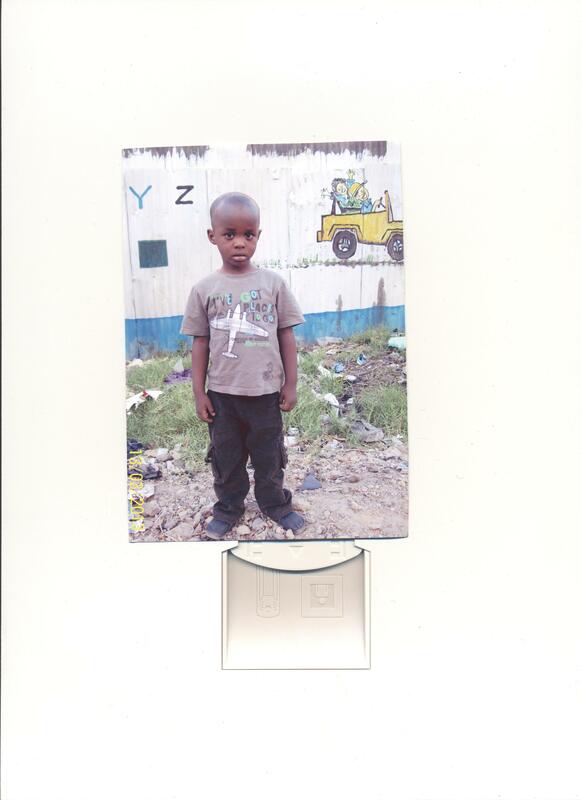 They have been given to Veronicah by Richard who has flown them out to Nairobi and taken to the village by Veronicah by Matatu (local bus). 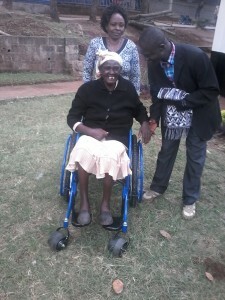 I am very grateful to Veronicah as she stayed in Nairobi at her own expense to wait for the wheelchairs. 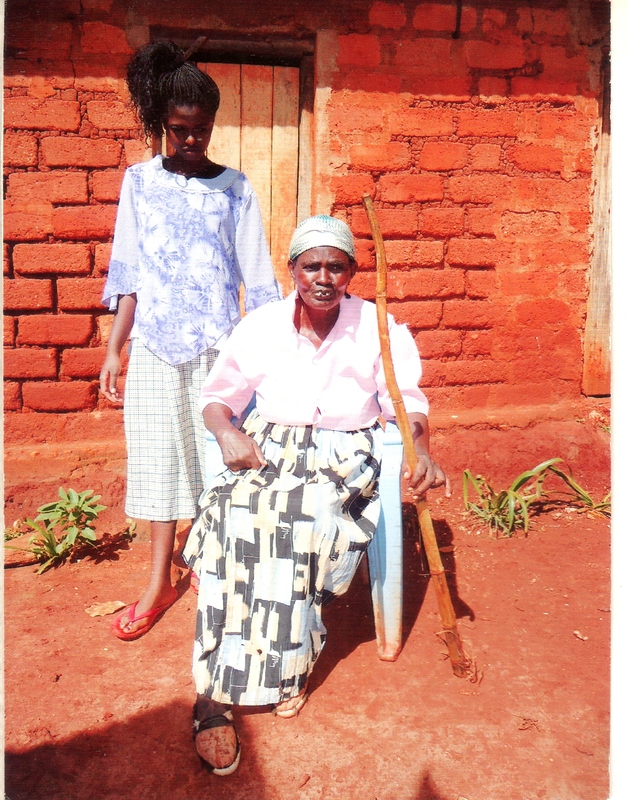 Agnes (Above) is 67 and has had a stroke and is unable to speak or walk unaided. She also has no toes. Many thanks also to Norah Keitany the Orthopaedics manager for the Nairobi branch of the Association for the Physically disabled of Kenya. 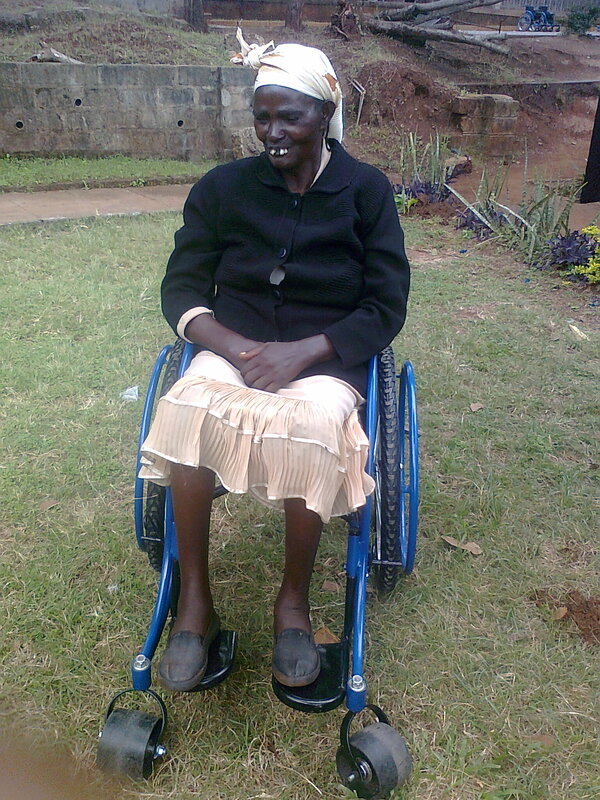 Agnes has been able to take her wheelchair following one fitting and was said to be “happy, very happy”. (Sadly Agnes passed away on December 8th 2013). 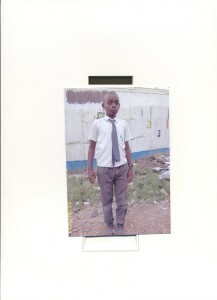 The Rotary club of Nairobi did also kindly offered funds towards transport costs. Rachel will have the one from Iain and the one I donated went to Sarah, another elderly woman in need of one in the village. 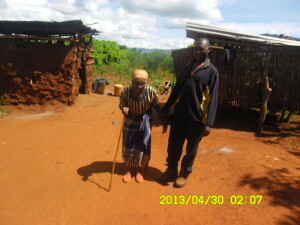 This is an example of determination to meet a challenge from the other side of the world for the good of an elderly people. I am obviously extremely grateful to both Richard and Iain and cannot thank them enough for their kindness. To show my gratitude to Richard for arranging the transportation he has asked her to share with you the charity he supports and would welcome any donations. Rhino Ark raises money for the building of the one of the world’s largest eco-fences, designed to fence in Kenya’s Aberdare National Park and surrounding indigenous State forest land, which together comprise a total of 2000 km2. This area is now described as the Abedare Conservation Area (ACA). This not only provides an “ark” for endangered species, such as rhino and bongo, but preserves one of Africa’s greatest eco-systems. If you have enjoyed my story and would like to join me in thanking Richard and Hybrid Solutions please give a donation via their Just Giving page. Caron, this was a truly inspirational story. It proves that mankind is, overall a loving caring species that does want to help and care for their own. The efforts that you went to and the help you received was phenomenal. My youngest daughter spent a month in Kenya in October 2013 with a charity called Moving Mountains and it had a massive impact on her. 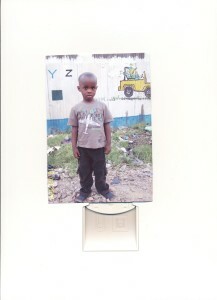 I am still in touch with Veronica and hope to visit Mbooni in 2017. 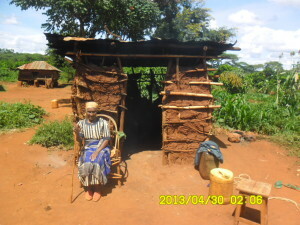 The ladies send me messages via her and I would love to meet them and see the village.